Bossy Italian Wife : Our First Eggs!!!! The other day I was gardening over at my friends' house. Martha and Kevin have set my mother-in-law and I up with a premium planting area, and we are so very thankful! Kevin also helped get us set up with our chickens this season, and he got chickens the same time as we did from the same people. While gardening, Martha approached, opening her hand, and revealed the sweetest little egg that one of her chickens had laid. I was spellbound because I heard that they wouldn't lay for at least eight more weeks. "You should check when you get home," she said. When I got home I told my husband and we immediately made our way over to our pen. We opened the laying boxes and there was not one, but three sweet, little eggs! I felt so proud!!!! A week in and our chickens gave us some eggs! I take it as a sign that they are really comfortable and very happy. So, here they are: our very first eggs!!!!!!!!!!!! 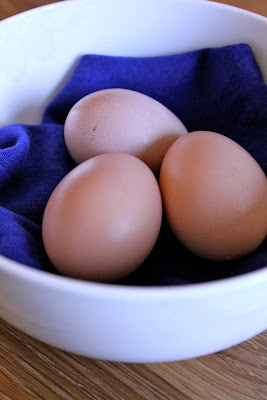 ALSO, our chickens have continued laying eggs since we first discovered these lovely three. AND, miracle of miracles: one was a double yolk! How cool is that?! This chicken jumped on the roof of the hen house, which I thought was pretty funny. And my husband has them eating out of the palm of his hand.